The Black Pope ! The Real Leader of the Illuminati. Black Pope. “Black Pope” is a designation given to the Superior General. The name follows from his leadership of the largest Catholic, male religious order and from the color of the plain black cassock worn by members of the Society, including the Superior General. The formal title in Latin is Praepositus Generalis, which may fairly be rendered as “superior general” or even, “president general”. The term is not of military origin (despite popular misconceptions and Ignatius of Loyola’s own military background) but is derived from “general”, as opposed to “particular”. This usage is consistent with other Catholic religious orders, like the Dominicans’ “master general”, Franciscans’ “minister general”, Carthusians’ “prior general”, and with civil posts such as Postmaster General and Attorney General. The Jesuits are organized into provinces, each with a provincial superior, (usually referred to as the “Provincial Father” or just “Provincial”), with the head of the order being the “general superior”, for the whole organization. As a major superior, the Superior General is styled “Very Reverend”. The Most Powerful Man In The World ? He is the most powerful man on Earth, who rule over Maritime Laws (business) . He controls the banking system, Freemasonry and the Secret Services (CIA, FBI, NSA, SIS, MI6, Scotland Yard, Mossad, CSIS, DGSE, FSB). He is a part of the Arcana Arcanorum controlled by the Papal Bloodlines within the I-Mori. These bloodlines are the omega point of control. These are the Farnese, ORSINI, Aldobrandini, Somaglia & Breakspear. Their war room command center is within the Borgo Santo Spirito which is missile protected! Viktor Emmanuelle IV wanted to nuke this region of Rome. Henry Breakspear and Pepe Orsini are in high control! Jesuit Assistancy Soldier, James Grummer controls the United States Corporation. 1. The Superior General of the Jesuits The Black Pope, Adolfo Nicolas and his 6 generals control the “White Pope” Pope and the Vatican. Superiors General are elected by the General Congregation of the Society, summoned upon the resignation, retirement or death of an incumbent. 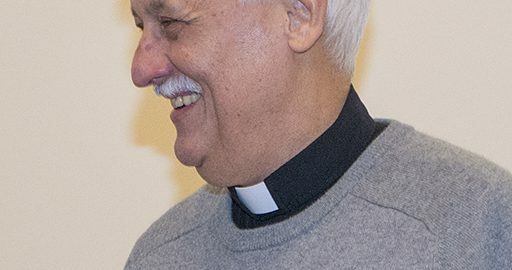 Superiors General are elected for life and almost all have served life terms, the exceptions being Father Pedro Arrupe (resigned for reasons of failing health) and his successor, Father Peter Hans Kolvenbach. Kolvenbach’s resignation was announced in February 2006, which led to the convocation of the 35th General Congregation. That General Congregation elected the current Superior General of the Society, Father Adolfo Nicolás, who succeeded Kolvenbach. The prophecy concerning the rebirth of the Holy Roman Empire is one of the most critical prophecies in the entire Bible. Without proper understanding of this prophecy, it is impossible to really grasp the entire scope of the prophecies God has given us. The prophecy concerning the rebirth of the Holy Roman Empire is one of the most critical prophecies in the entire Bible. The rebirth of the Holy Roman Empire actually happened on November 3, 2009. Its fulfillment was one of the five most important prophetic fulfillments in the last two thousand years. One reason this prophecy is so important is because the Antichrist and the False Prophet will both come out of this reborn Holy Roman Empire. Let’s first of all understand the setting when this prophecy was given. At the time it was written, Israel was under Babylonian captivity. The Jewish people had been sent into exile for seventy years because of their disobedience to God. Daniel and the three Hebrew children were among the first to go into captivity. Because of their ability and exceptional intelligence, they were quickly placed into leadership positions. Daniel became one of the spiritual advisors to Nebuchadnezzar, the king of Babylon. Babylon ruled the entire world at the time. One night, Nebuchadnezzar dreamed a dream. When he awakened the next morning, he knew he had dreamed a very unusual dream, but he couldn’t remember what he had dreamed. Nebuchadnezzar demanded that his wise men tell him his dream and its meaning. When they could not tell the king his dream, Nebuchadnezzar was so angry that he ordered the killing of all the wise men in the kingdom. When Daniel heard about the king’s dream and his order to destroy all the wise men in his realm, he requested time from Arioch, the king’s captain, promising to tell the king his dream. Daniel and the three Hebrew children prayed and fasted, asking God to reveal the king’s dream. That night, God showed Daniel in a dream what Nebuchadnezzar had dreamed and its meaning. The next day Daniel was ushered into the presence of the king. Daniel told the king, that he could not know nor interpret the dream himself. However, he served a God who reveals the secrets of men’s hearts, and He could reveal his dream. Then Daniel proceeded to tell the king what God had showed him. The Bible is extremely Accurate. Both thees Horses started running together in a Northern Direction , Both this Evil believe systems that bow before satan is based in the North = Europe Union . 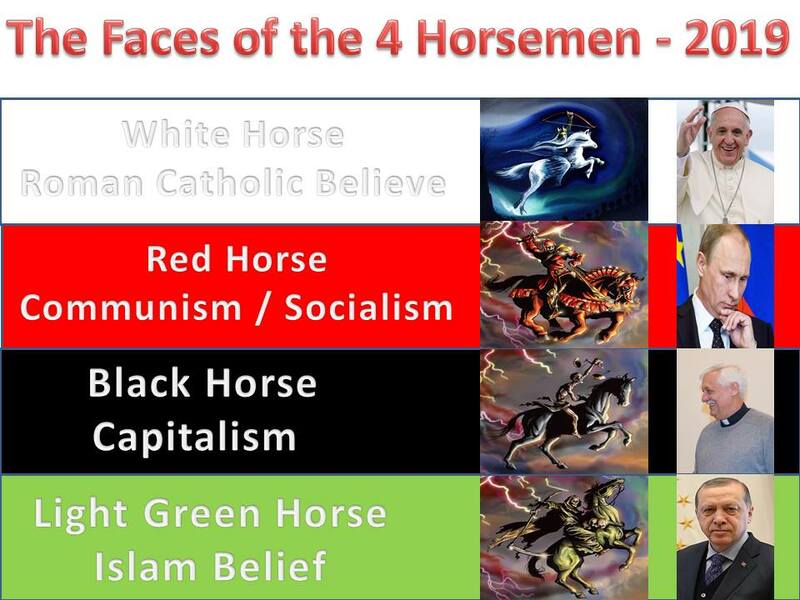 It is Confirmed in this article that the Black Horse is now in control of the White Horse and the Rider of the Black Horse = The Black Pope wants his Throne on Temple Mount in the 3rd Temple when it is finally Build. It is also Confirmed that the Black Pope controls the Knights factions of the Templar Knights and the Malta Knights . and at the End is the Master of Both False Religions currently causing the Great Falling away in the Church called the False Doctrine of the New Age Apostolic Reformation Movement (NAR) and the Christian Zionist Movement that is currently in the hands of the Trump Administration.